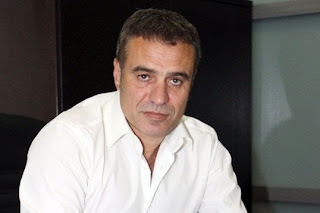 Former Besiktas and Bursaspor coach Ertugrul Saglam , will be Eskisehirspor's new coach. After leaving ,Bursaspor early this year, he was waiting for offers from other teams. 43 years old coach, former soccer player from Samsun and he played for Besiktas many years. He coached Samsunspor and Kayserispor too. 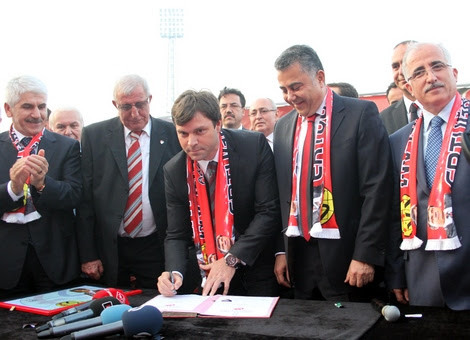 On Friday, Eskisehirspor hold a signing day at the Eskisehir stadium for their coach Ertugrul Saglam. With fans and Eskiseher band in the stands, Ertugrul Saglam and team official inked the deal in front of their fans. Ertugrul Saglam said, he is very happy to come to Eskisehir and he said ,he will try hard to do same-thing he did in Bursa, taken Bursaspor to league title. Turkish National U-20 team came back from behind to beat Australia 2-1 and advance to sweet sixteen in the FIFA's U-20 World Cup tournament. The match played in Trabzon ,Avni Aker stadium and there were over ten thousand spectators in the stands. It was kind of do or die match for Young Turks ! Turkey woke up and two minutes later scored the equalizer goal..
Midfileder Hakan Calhanoglu trapped the header pass from his team mate then strike the ball far corner of the goal . In the 87th minute, Okay Yokuslu scored the tournament of the the best goal! From about 20 yards out he chip theh ball over Australia's keeper and scored beautiful goal. With this win Turkey advance to last 16 round in the tournament. Young Turks will face France on Tuesday. Two teams who are in trouble with UEFA, finally decided to hire their new coaches today. Besiktas team will be coached by Slaven Bilic and Fenerbahce's new coach will be Ersun Yanal. 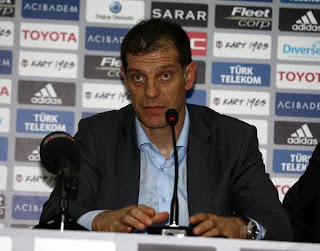 Bilic inked three year deal with Besiktas while Ersun Yanal signed only one year deal ! Besiktas one year and Fenerbahce will be banned three years from going to Europe ! Bilic was sacked by L. Moscow team this season. He made a name for him self during the Euro 2008 tournament with Croatia National team. Ersun Yanal , left Eskisehirspor to come to Fenerbahce. Ersun Yanal signing only one year deal is very interesting too..
Besiktas one and Fenerbahce banned three years from all European competitions by UEFA . Here is the news from UEFA WEB SITE.. The UEFA Control and Disciplinary Body (CDB) today announced its decisions following the disciplinary proceedings relating to Fenerbahçe SK (Turkey), Beşiktaş JK (Turkey), and FC Steaua Bucureşti (Romania). • Beşiktaş JK is not eligible to participate in the 2013/14 UEFA Europa League. • Fenerbahçe SK is excluded from participating in the next three UEFA club competitions for which it would qualify, including the 2013/14 UEFA Champions League season. The ban for the third season is deferred for a probationary period of five years. • FC Steaua Bucureşti is not eligible to participate in one UEFA club competition for which the club would otherwise qualify. This sanction is deferred for a probationary period of five years. All clubs have the opportunity to appeal the decisions of the CDB to the UEFA Appeals Body. Further, in relation to the individuals of the clubs involved in the cases of Fenerbahçe SK and Beşiktaş JK, the CDB decided that certain additional information will be collected in order to consider in further detail the different position of each of the individuals concerned. Turkey's U-20 National team has comfortably won its first game FIFA Under-20 World Cup tournament that it hosts for the first time in its history. The Turkish players defeated easily 3-0 El Salvador at Trabzon Avni Aker stadium. Turkey's young talent Salih Uçan opened the score in the 9th minute after an assist of Cenk Şahin, scored two goals in the 46th and the 64th minutes. With the victory Young Turks has taken an early lead in the group B after Colombia and Australia drew 1-1 in the other game of the group earlier June 22. Turkey will play its next game against Colombia in Rize, Turkey.